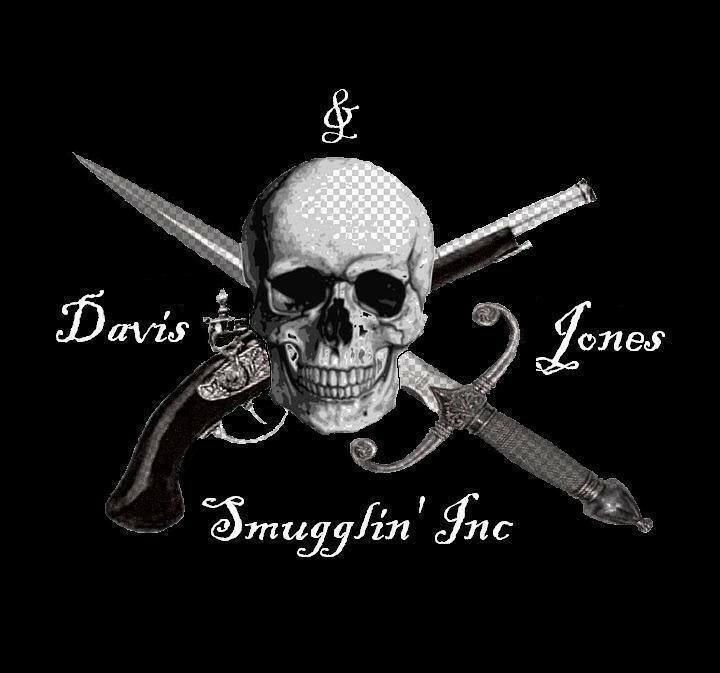 The pacific northwest is home to many great pirate crews. These are some of their ensigns. Hover over each to see a description. Some have clickable links as well. 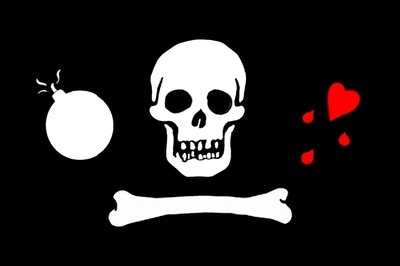 The personal ensign of the pirate John Christopher Roberts (aka "Topknot"), this is also the flag of his ship, The Outrageous Fortune. 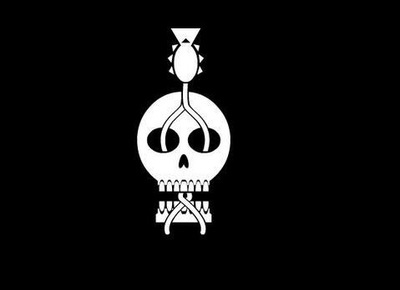 As are all pirate flags, this one is designed to strike fear into the hearts of merchant captains, with it's stark imagery of Topknot as a skull in profile, his signature knot flying, and clutching a bleeding heart pierced by a dagger. 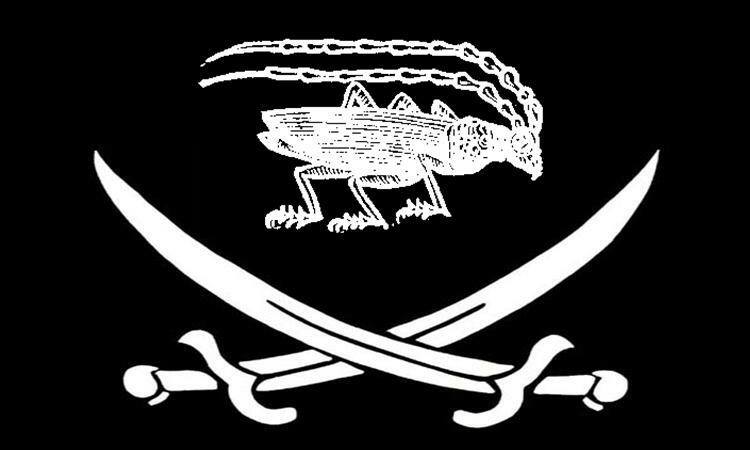 The flag of Robert "Cockroach" Blair. Naturally, it reflects a noble image of "La Cucaracha" a nickname given Blair by the no good Spanish. They gave him the name because he would attack then scuttle away before they could counter attack with any effect. Blair proudly adopted the name and the song that the children sing in his honor even today. The flag of the Buccaneers of the Black Fleet. 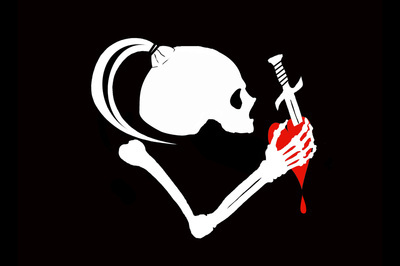 The skull and bone motif is designed to strike fear into those ships chosen by the buccaneers. The lit grenado indicates Captain Gunpowder Gertie's preferred mode of clearing the decks, and the bleeding heart reveals the consequences of ignoring her commands to surrender. She and her ragtag crew sail the Pacific looking for treasure to acquire, and to vex the King's Navy at every opportunity. 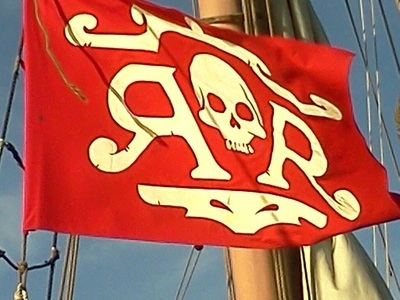 The flag of the Tallship Royaliste. An interpretation of a ketch-rigged privateer typical of those in service between 1755-1812, Tallship Royaliste has survived fire, flood, hurricane and most recently, crushing by sternwheeler. Follow the journey as Margot, Luc, and their brave crew strive to keep Royaliste afloat. 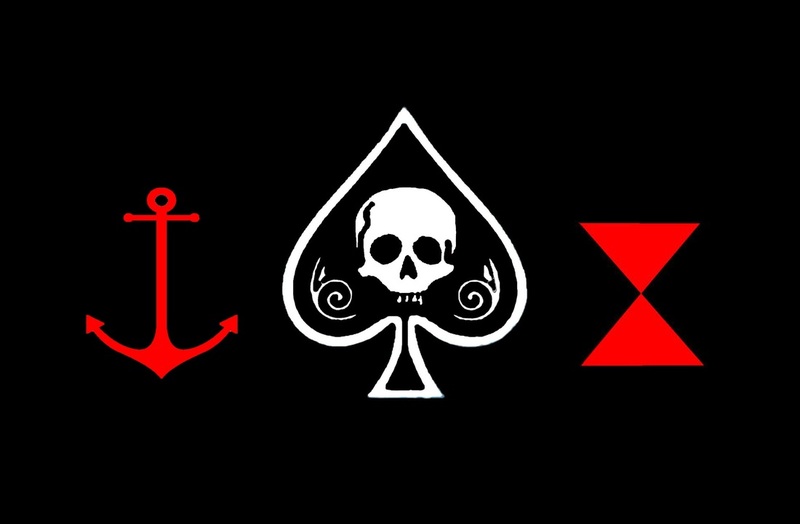 Ace of Ruin & the crew of Salacia's Favour lives by the code of the dead before them: Hold fast to what you have, use your power & dread to bring ill fate to those that cross you, live your days as if they were your last. With the Devil at their tail & Poseidon's wife as their figurehead, the crew of The Ace of Ruin looks aloft, even the captain removes his hat to salute their colours. Sail Under The Spade, and Your Fortune Is Made! This be the flag of a small band o “sailors o fortune” or if’n ye will “merchants o mayhem” … Nellie Blye Davis n her right hand man Steve, in cahoots with the wander’n shiftless pirate Angelo Jones took to “doin business” bringin goods and such to “those in need”. 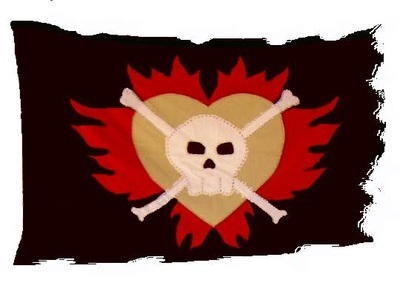 The Flaming Heart of Gold is the personal ensign of Lorien Stormfeather. It once flew above the Lady in Elliot Bay thanks to a kind Bosun. sshhh....Don't tell the Coast Guard. Jack of the Emerald Rose. Emerald in the eye and Rose in the teeth. So named for the crew hailing from the Emerald City of Seattle WA and the Rose City of Portland OR. 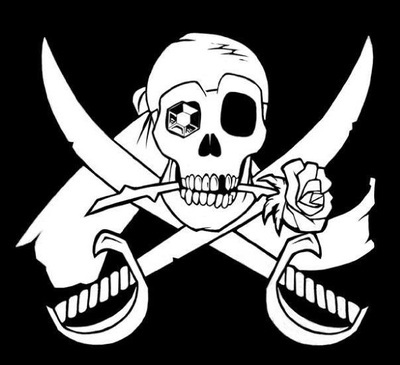 BOOM Pirates / Brotherhood of Oceanic Mercenaries. The flag of PDXYAR and their flagship, El Tiburon. 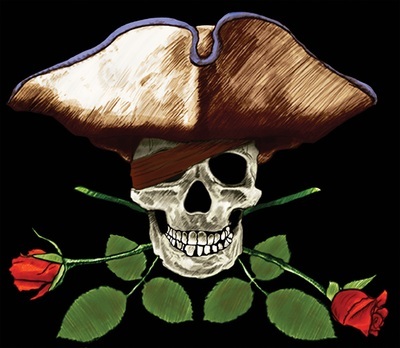 The Swashbucklers of Stumptown, Portland's Premiere Privateers, The Corsairs of the I-5 Corridor! 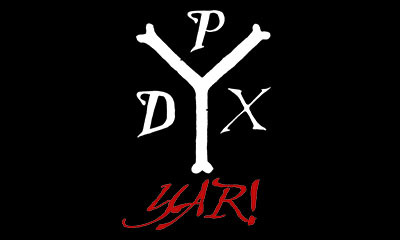 These are some of the most cutthroat scallwags, rogues, and mercenaries to ever set sail on the Northwest Coast.. PDXYAR was banded together in 2008 and has since been raiding ports with their unique brand of piratical living history and "entertainment".